Saline Soothers are a new product from the makers of Boogie Wipes! I am so thankful right now for Saline Soothers. My son is sick and now I am sick with a terrible runny nose (it never fails, mom always gets what the kids get)! The tissues we had kept leaving my nose red and sore. My son has been using Boogie Wipes for a while with no complaints. 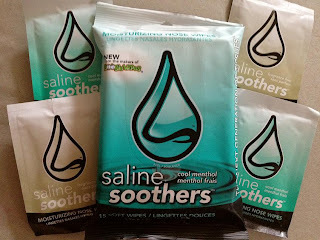 I tried the Saline Soothers that are made just for adults and WOW I am so impressed. They feel so good and my nose was no longer sore or red. They are just as great as the Boogie Wipes. I love it that both the Boogie Wipes and Saline Soothers were created by moms just like us! You can buy these Saline Soothers at the same retailers you find Boogie Wipes or thanks to Saline Soothers 1 lucky Tips 4 Saving reader will have the chance to win 2 packs of their own! To enter please fill out the easy Rafflecopter form below! I like that they won't dry out your skin like a kleenex. It's hard to find something I like the most. I just love that they clean and soothe the nose. Awesome!